Bethesda, MD -- In what is sure to be the first in a long line of big events, yesterday’s Big Train Celebrity Softball Classic raised a significant sum of money to help build local youth baseball fields. 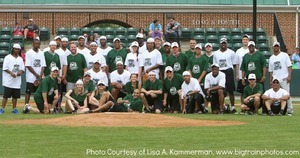 The game showcased a team of athletes (led by members of the Washington Redskins, Maryland Terrapins basketball, and the Washington Wizards) and a team of media members (including those from Comcast SportsNet, ESPN980, 106.7 the FAN, and local affiliates of NBC, CBS, and FOX). While some of the players were more experienced in softball or baseball, others were not so lucky. Brandon Banks (Redskins, wide receiver) had never even picked up a bat before yesterday’s game. However, when asked who he would give the MVP award to, Banks had an interesting answer. The Athletes defeated the Media by a close score of 3-2, surely setting up an intense rivalry for years to come. Many athletes and media members were happy to stick around after the game to do interviews and sign autographs or take pictures with the many hundreds of fans that came to Shirley Povich field to support a great cause. As for the media? There’s always next year.